Warner made a stupendous comeback with a scintillating 85, helping his side reach a challenging 181/3. 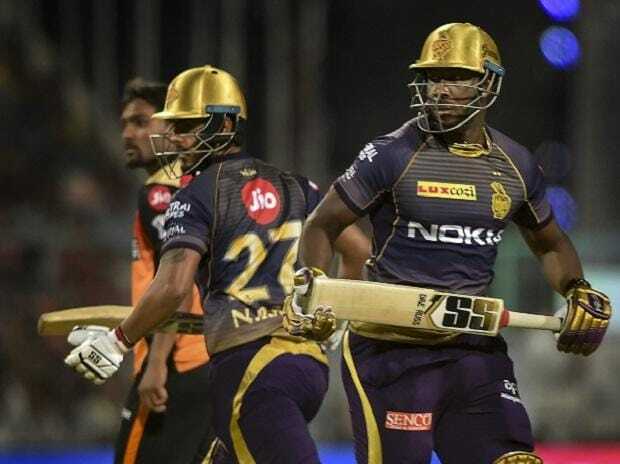 In the Match 2 of VIVO Indian Premier League 2019 (IPL 2019), Andre Russell smashed an explosive 49 to spoil David Warner's scintillating IPL comeback as Kolkata Knight Riders pulled off a dramatic six-wicket win over Sunrisers Hyderabad at The Eden Gardens on Sunday. Needing 53 runs from last three overs, the powerful Jamaican changed the course of the match with his big-hitting against Siddharth Kaul, creaming off 19 runs from that over. He retained the strike by taking a smart single and continued his assault on Bhuvneshwar Kumar, who too bled 19 runs in the penultimate over as KKR sealed the 182-run chase with two balls to spare. Russell hammered four sixes and an equal number of boundaries in run sequence that read 6-6-1-4-1-4-6-4-0-6-1. Youngster Shubman Gill (18 not out) completed the formalities with two sixes off Shakib-Al-Hasan. Karthik's captaincy was over-defensive and lost the review to Warner early in the second over, while SRH made full use of the DRS by overturning a decision against Bairstow.